SP-Index role-based online social profiling checks are dramatically de-risking recruitment by providing a ‘new breed’ of information to support decision making. The report improves your matching by outlining an individual’s online cognitive behaviour, based on their digital footprint, while remaining compliant. Although it is legal to read about a person on social media sites, it divulges protected characteristics about them which could put you at risk of discriminating against them. 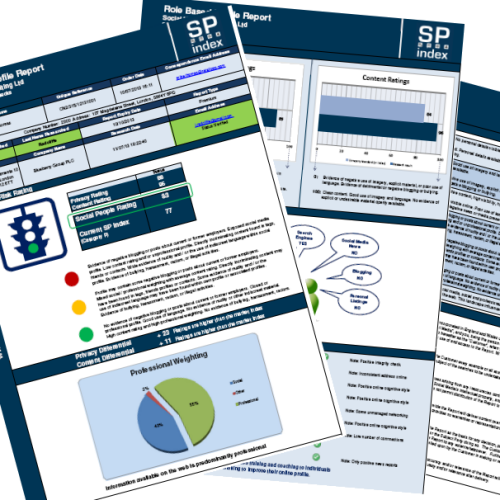 SP-Index reports provide you with all the information you need to support well-informed decisions about your potential risks, without breaching legislation or regulations. Order your own report to see how it works. Gaining SP-Index certification demonstrates your expertise in the use of online social profiling for the purposes of talent matching and employment. When all else is even, each short-listed candidate’s online cognitive style and profile will support decision making concerning how well they fit your clients’ values, culture, team and vacancy. Employer Risk Rating: A traffic-light system which can indicate training requirements. Privacy Rating: A measure of information that an individual makes freely available to everyone online. Content Rating: A measure of commercially unfavourable content. Professional/Social Weighting: Weighting of professional and social posts made. Visibility Landscape: The variety of areas in which an individual is apparent online. SP-Index checks can be adjusted depending on the role, the organisation’s culture and function. We are confident that enhancing your service in this way will increase your revenue by making you more competitive while perhaps enabling you to charge an additional premium.